Easy Pill is simple medication tracker and reminder. 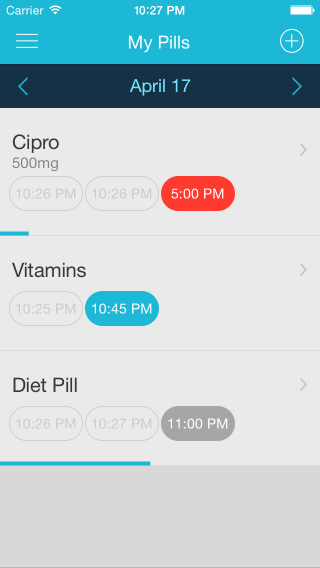 The app uses unique color-coded graphics to keep track of your meds, has intuitive user interface and allows to set up any kind of reminder. Easy Pill will build time schedule based on your answers (dose time can be set with accuracy up to the minute on Pill Details screen). Easy Pill is the only pill tracker that manages your medication as a course. Course duration can be set from 1 day to 1 Year or constantly. The app displays elegant progress bar to see how close you're to finish. Completed pills are moved to archive automatically - you will always have your past prescriptions in your hands ready for next doctor's visit (if you ever need one). You can email your archive or repeat course.